Earlier on WPBeginner, we showed you how to embed tweets in your WordPress post. Recently Facebook announced the ability to embed Facebook Status Posts anywhere on the web. In this article, we will show you how to embed Facebook statuses in your WordPress posts and pages. What Kind of Facebook Status Posts You Can Embed? Clicking on the date or time link will open that particular status update. Copy the URL of the Facebook status that you want to embed because you will need it in the next steps. 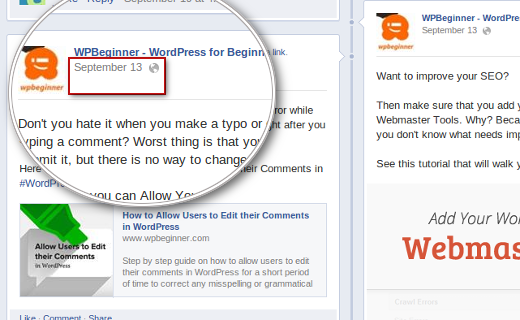 There are two ways of embedding Facebook statuses in WordPress. The easiest way to embed Facebook statuses in your WordPress posts or pages is by installing and activating the official Facebook plugin for WordPress. After activating the plugin, simply go to the post and paste the URL of Facebook status you want to embed in its own line. Save your post and preview it. You will be able to see the Facebook status embedded right into your post. 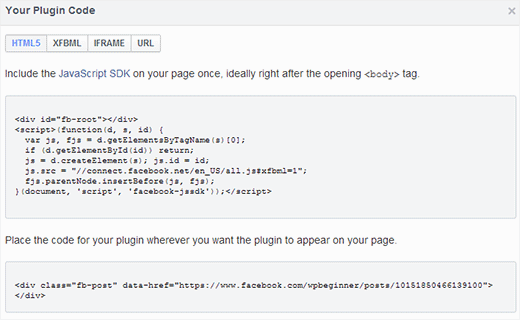 If you do not want to use the Facebook plugin, then you can manually embed Facebook status posts in WordPress. However, this solution is not as neat as using the official plugin. First thing you need to do is get the URL of the public post you want to embed. Go to Embedded Posts page on Facebook Developers site. Paste the URL of the Facebook status and press the get code button. A popup window would appear with two options to choose from. The first option is to add the HTML5 code. Copy the first piece of code and paste in your theme’s header.php file just below the <body>. You will only have to paste this once. After that simply copy the second code and paste it where you want to embed the post status in your WordPress post or page. WordPress by default has built-in support for various oEmbed providers like Twitter, Youtube, etc. We hope that Facebook enables the oEmbed protocol, so this becomes easier in the future. 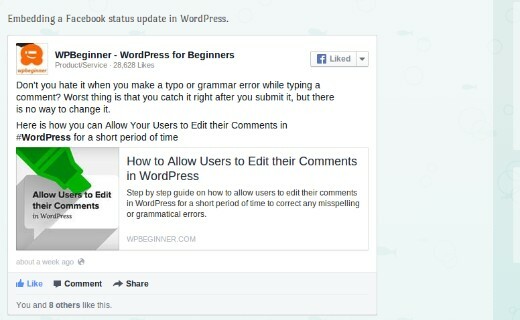 We hope this article helped you embed Facebook status posts in WordPress. Check out some of our Facebook articles: how to add a Facebook fan box, like button, and recommendation bar. 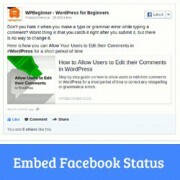 Would you embed Facebook status in your WordPress posts? Let us know by leaving a comment below. Do you know of a plugin that will still do this? We do not have one we would recommend at the moment. I would like to ask, is it possible to embed a facebook post complete with the comments. Not just the comment numbers. Are there any benefits (SEO, etc.) to embedding a Facebook or Twitter timeline manually vs using a plugin? This is old information and needs updating, there are issues with this plugin as to whether Facebook recognise it. I am not able to embed photos. Tried both these methods. will this plugin let you embed photos or events? I am only able to embed posts. Already Jetpack v.2.5 has Facebook embedding check it out here http://jetpack.me/2013/09/19/jetpack-2-5/ This is far more easier to use if you love Jetpack! Is there a way to automatically embed all of your Facebook timeline posts? I’d really love to know that, too!